Autonomous trams: Why? When? How? In recent years, systems designed to assist or ‘automate’ many of the most common functions of tram and LRV operation have gained prominence, using technology influenced by the automotive ‘arms race’ that is striving for increased driver assistance and even, at some point in the future, full automation. Greater autonomy for cars and goods vehicles are made possible by the continued emergence of technologies such as machine learning, image analysis, and Lidar. Advances in mobile and cloud computing and sensor technology have enabled the progress of these intelligent systems to the point where driver assistance systems that allow high levels of automation in highway conditions are now commonplace. While complete autonomy could be achieved by 2030, updates to infrastructure and the regulatory environment will certainly take longer. So, will the proliferation of new automotive developments, allied to established metro technology, offer the fundamental enablers for future fully autonomous tram operation? Is this technology practical and how far will it go? And what are the barriers to progress? better than a human being and they are generally more accurate and more consistent. What is far more complex is the anticipation of situations such as changing weather conditions and wheel/rail adhesion, or perhaps the courtesy of holding the doors for an extra few seconds to cater for a less mobile passenger, knowing that time can be made up elsewhere through sensible, safe judgement. Artificial intelligence and machine learning are evolving rapidly, but there is currently still an essential role for human judgement in what is a customer-focused industry. Therefore any transition period with mixed human and machine traffic in urban environments must be rigorously analysed and carefully managed. Automation of urban rail networks is far from new and figures from UITP show that 36% of the new metro lines opened in 2017 were fully automated. But in segregated environments an automated metro only has to make decisions in relation to what is in front of it. Computers and controllers can comfortably assume a clear alignment with track access prohibited by tunnels, barriers, bridges or screen doors. In contrast, trams and LRVs circulate in primarily open environments, mixing with other city traffic and pedestrians. With far more variables at play, drivers therefore have to make a wide range of decisions about their surroundings that are related to an almost endless amount of external factors – that can change quickly. A certain level of computer assistance is already here. Most of the major rolling stock manufacturers – and a growing number of aftermarket suppliers – offer ‘driver assistance systems’ (DAS) that promise everything from obstacle detection, speed warnings and real-time component monitoring at the basic level, up to speed and platform door control at the higher end. These range from simple and cost-effective retrofit solutions that repurpose existing technology, to more bespoke equipment that is specified as part of a system’s procurement (see panel). 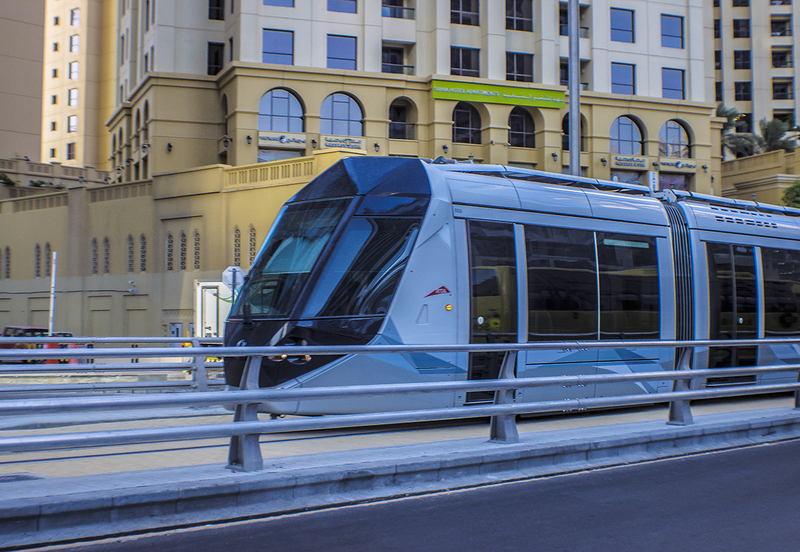 Dubai’s tramway, opened in November 2014, marked a world-first in the application of CBTC technology. With long segregated sections and a desire for higher commercial speeds, this solution was adapted from an existing Alstom product although, crucially, a driver remains in the cab. Yet the opportunities for autonomy go far beyond the automotive industry as we see public transport operators increasingly positioning themselves as ‘mobility providers’ and the boundaries between mass and private transport become increasingly blurred. Automatic system: One that performs tasks based on pre-defined rules; the information needed to comprehend its environment is provided to it to enable decision-making. It can be with or without a driver. Autonomous system: Capable of making its own decisions without human-defined instructions. It must therefore manage the functions of comprehension, environment analysis, and decision-making; responsibilities currently reserved primarily for human beings. To be truly autonomous, a tram must therefore be able to capture, perceive, analyse, plan, make decisions and act without human intervention. All this must be carried out in real-time. The key challenges of any moves towards increased automation will be of a technical, security, regulatory, social or societal nature. Yet autonomous vehicles of all kinds have common needs, whether they be a car or public transport: collision avoidance; high level communication integrity; self-monitoring of vehicle condition; management of degraded modes; situational management; and a minimum onboard intelligence to cover loss of communication. Technology will face the need for certification, standardisation, and will have to be justly insurable. The current legal void and lack of safety references on these types of solutions leads to many questions. Although amendments to the Vienna Convention on Road Traffic are under consideration, the current regulations state that a driver remains ultimately responsible for his or her vehicle. While there are reasonable arguments for rewriting parts of this important document to reflect advances in technology, it is likely that the fundamental point will remain for the time being. It will also be interesting to see how vehicle manufacturers draw that line of liability as greater levels of automation are made possible. No reference/security standard: Before allowing the circulation of autonomous vehicles on roads or granting operating authorisation in real conditions, validation and security will be necessary. For example, will any system that replaces a driver have to be the highest Safety Integrity Level, SIL4? In the event that the system has not been approved or certified at a safety integrity level by a manufacturer, the project itself must incorporate the implementation of the generic safety case. Evolution of regulation: This will allow the necessary testing to develop reliability and provide authorisation for service. It will be impossible to have a universal rule for all forms of autonomous vehicles in mixed traffic and the highway code and public transport regulations in each country will require consultation. Who holds liability? Likewise, liability in the event of an accident must be determined – is it the manufacturer, the software programmer, the operator, or the mobility authority? What will be the level of risk acceptance? Who will qualify it? The fight against cybercrime: Any service requiring a high level of computerised intervention comes with the associated risks of cybercrime. As soon as there is communication between the vehicle and its environment, the vehicle must be ready to make a decision when it sees something, or by remote control if operated this way. In a more global environment, new digital threats generated by increased online connectivity may have an impact on operational safety. The important period of cohabitation: During this period of transition, questions will arise in terms of ‘driving practices’ and shared responsibilities. Machine learning will have to develop response-driven strategies that adapt driving. Return on investment: Cost must integrate investment, operation, maintenance and upgrades over a complete lifecycle. Any value analysis must be carried out case-by-case, and according to context as well as individual operators’ needs. Degraded modes: Trams and cars must manage ‘degraded modes’; these may be caused by the failure of any element that contributes to service provision. Such failures may require human intervention at source or even removal of the degraded mode. These situations, currently managed by the driver, must be listed and identified. Anticipating danger: Any scenario that involves emergency braking can directly affect the safety of passengers, as well as the availability of the transport system. Emergency manoeuvres must therefore remain exceptional. Onboard intelligence will require the capacity to anticipate potential dangers, equivalent at least to that of a human driver. Passenger movements: Service departures near pedestrians must be managed. It is also important to think about evolution of stop layouts, for example to discourage passengers from crossing in front of vehicles. This may result in new warning systems. Practical operational matters: For tramlines in urban areas, general challenges include the location of vehicles (based on headway rather than timetable), balancing passenger density, and guaranteeing optimal dwell times. With these in mind, instructions are passed to drivers who adapt their movements with respect to other trams or LRVs on the line. This level of line management must therefore be integral to the ‘automation’ system, as it will have to oversee optimum running speeds while also dealing with obstacle detection in real-time. Trade-offs between traction power, energy consumption and risk management may therefore arise. Human factors: Close co-operation with those employed in operational functions is crucial as we consider the impact on the labour market. In the immediate term, questions exist such as how can we ensure that automation supports the person in the system, and what happens when it fails? Trust is also a major concern. In the early years, operators, passengers and other road users will face an adjustment period to place their full trust in the technology and this handover period needs to be carefully managed. What are operators doing now? The consequences of even minor collisions can be significant and undertakings around the world are already implementing DAS and the first steps towards tram automation. A study from Hannover operator üstra revealed the cost of such incidents over a ten-year period amounted to a staggering EUR6m; this doesn’t include the disruption of removing damaged vehicles from service. Some of the first work on so-called ‘driver vigilance systems’ began with a partnership between üstra and Frankfurt-am-Main operator VGF in 2013. A joint pilot project evaluated the capabilities of two systems: the first from Bosch Engineering, trialled by both VGF and üstra, and the second from Bombardier, which VGF tested. Both could be considered the first steps towards LoA1. The Bosch system combines data from a video camera and a radar sensor to monitor objects in the rail area and measure their distance to the tram. Software in the DAS control unit evaluates whether a collision is likely, and if it is, triggers visual and audio warnings to alert the driver who then has two seconds to either override the warnings or take action. If an intervention doesn’t take place then a safety braking sequence is initiated. Bombardier’s stereo camera system relies on cameras alone to scan for obstacles of more than 40cm in size in a 15-60m area in front of the tram; three cameras underneath the destination display offer a three-dimensional view. Again, software evaluates the chances of a collision before triggering a warning to the driver; automatic braking can be configured as the next step. Impressed with the trials, VGF has now installed the Bombardier system on 74 S type trams, using the Bosch system for its older R type Düwag cars. Baselland Transport (Switzerland) is evaluating a similar collision warning system, working with rolling stock manufacturer Stadler and Bosch. If the trials are deemed successful, the DAS will be rolled out across the BLT’s fleet of metre-gauge Tango LRVs. Metrotenerife took the path of developing its own SIMOVE DAS that uses GPS to continuously monitor the speed of its Alstom trams in relation to appropriate set line speeds. If excess speed is detected, the driver is first given an audible warning and if no intervention is seen the system can apply the brakes. Using readily available technologies, SIMOVE also features a web application for full event logging and driving analysis tools that can be used for further driver training. Given the high annual costs of collisions on larger systems, is has been suggested that investments in DAS could be paid back in as little as two years. In France, tests within a controlled environment have also shown that LoA3 and LoA4 are possible, such as the trials undertaken at RATP’s T7 depot in Vitry-sur-Seine, Paris. A combination of technologies have proven that a Citadis tram can start and stop by itself, recognise obstacles and follow pre-determined routes supplied by the Easymile start-up (in which tram manufacturer Alstom has a stake). The trials are now in their next phase. Most recently, in September Siemens announced a ‘world first’ in its own research to be carried out during the InnoTrans trade exhibition in Berlin. Working in partnership with Potsdam operator ViP, a Combino tram fitted with Lidar, radar and cameras was to operate over a 6km (3.7-mile) section of the network in real traffic, although without passengers. Artificial intelligence is said to allow the tram to respond to signals, stop locations and to hazards such as crossing pedestrians and other vehicles. The company stressed that while the technology is not currently available for commercial use, it is in discussions with ViP to continue development of the system beyond the InnoTrans trial period. Article originally featured in October 2018 TAUT (970).